How inappropriate to call this planet earth, when clearly it is ocean. Spin a globe. One whole side of the world is covered almost entirely with oceans! Oceans cover approximately 70% of the earth’s surface. The Atlantic, Pacific, Indian, Arctic and Southern Oceans are all connected. The waters in the oceans are in constant movement. They sink and rise with temperature, density, and salinity creating currents known as thermohaline circulation. Thermo refers to the ocean’s temperature and salinity to its saltiness. Water that has more salt content is denser and sinks in the ocean. 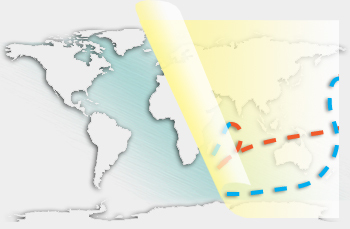 The currents move clockwise in the northern hemisphere and counter clockwise in the southern hemisphere due to the rotation of the earth and the winds moving. These currents form the ocean’s conveyor belt; the world’s smallest organisms (viruses) and the largest (the blue whale) live in these moving waters. Tiny plants called phytoplankton live on and drift with the circuits. Blooming in the spring, they use sunlight and carbon dioxide to make food giving off oxygen. While many people from all around the world make their living on oceans, scientists called oceanographers study ocean life and collect data on its depth, shares and sea life. Barely 5% of the earth’s oceans have been explored. The ocean is earth’s last frontier! Print a map and locate and label the world’s major oceans. 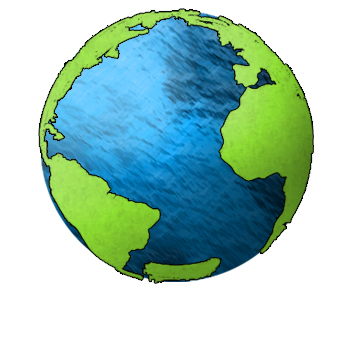 Using trace paper over your ocean map, draw the ocean current that is cold using a blue marker or colored pencil. Next, take a red or orange marker or pencil and color the warm ocean currents. You have mapped the oceans’ conveyor belt! The ocean is teeming with life. There are many animals in the ocean, including people like you! Play the ocean animal game and see if you can tell the difference between fish, mammals, mollusks, crustaceans, reptiles and birds! Oceans also have underwater plant life. Pick an ocean. Research the life in that ocean. Start with life at the top of the ocean, upper third, middle third, and lower third and on the ocean floor. Include plant and animal life. 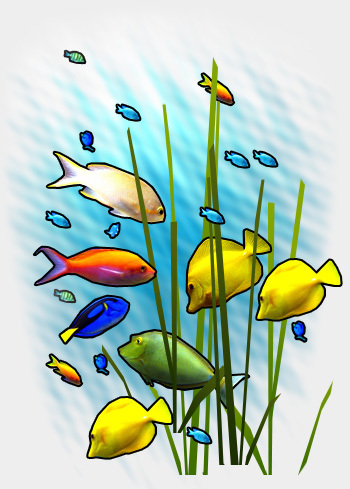 Make a poster that shows the life in your ocean at varying depths. Label each plant and animal. The ocean is teeming with life! Oceans lose and gain water in a never-ending process called the hydrologic cycle. Warmth from the sun and wind lift moisture from the ocean surface. The invisible particles of water vapor mix with air and dust forming water droplets. When the air cools, the water droplets form clouds. Clouds, in turn, deliver rain and snow on land that runs into rivers and flows back to the sea. Almost 77 percent of all precipitation, though, falls directly back into the oceans. Scientists are now tracking relationships between weather conditions, changing air movement, the hydrologic cycle and the carbon cycle. Scientists now see changes in ocean temperature as causing changes in ocean current and changes in air movement. You can make your own model of the ocean’s water system. You will need two half gallon plastic food containers, a rock, a cup of water, some blue food coloring and masking tape. Pour the water in one of the containers adding a few drops of the blue food coloring. This is your ocean. Put the rock in the water. The rock should rise out of the water. This is your continent. Now place the other container upside down on top of your ‘ocean’ Tape the two containers together and place them on a sunny windowsill. You can watch water droplets form on the sides of your containers and drip back into the ocean. Note that the dripping water is not blue. The food coloring, like salinity and pollutants, are heavier and are left behind in the ocean. Now that you have watched the ocean and atmospheric cycle, research the connections between our oceans, our air and our carbon cycle. Make a poster showing how these three cycles are interrelated. Many, many ships have been lost to the ocean. On the bottom of the ocean floor, there are many sunken treasures to be had! 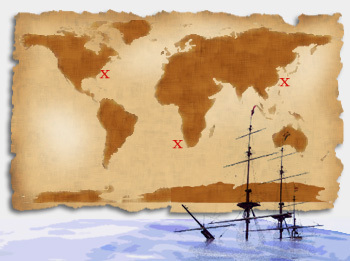 Research known sunken treasure expeditions. Make a map of believed shipwreck locations and the booty that is on the bottom! On that map, record ocean depths. Most sunken ships and treasure hunts require special underwater equipment. Research what kind of equipment you will have to gather, wear, and use to find your treasure! Can you go by yourself? Will you need other people? Will you need ships, cameras, clothes, and supplies? How much will all of these supplies cost? Once you have your map, an expedition brief, a list of everything you think you need, create an itemized budget. Be prepared for an underwater adventure. Pollution, climate change and ocean acidification are challenges to the health of our oceans. Pick one of these topics to research what we now know about protecting our oceans. Storyboard a short video that explains why the ocean is important, what problems we as people are challenging it with, and what each of us can do to help protect our oceans. Be an ocean activist! __________ refers to the saltiness of the water. The oceans provide over ___ of the world’s oxygen. What is changing the health of our oceans? TEDed How do Ocean Currents Work? TEDed Will the Ocean Ever Run Out of Fish? Video TEDed How Big is the Ocean?